Portal Rush is a fast-paced arcade puzzle game. 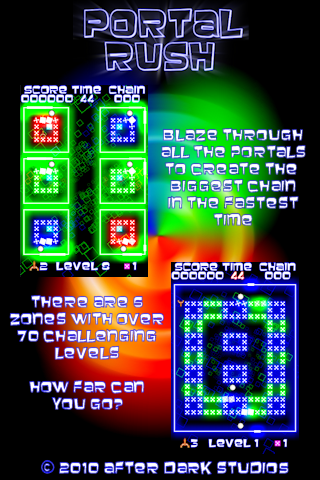 Using your laser ship, you have to collect all the portals & create the biggest chain in the fastest time, while avoiding the comets. 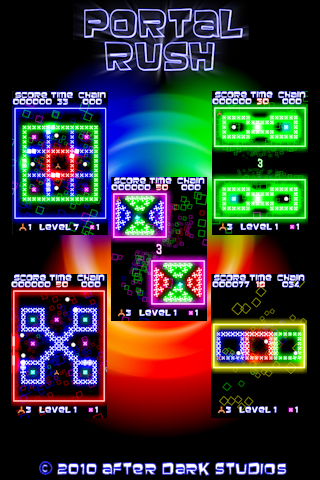 There are 6 zones with over 70 challenging levels, and you have 3 lives to complete each one. After completing the 3rd zone you will unlock Supremacy mode. In Supremacy mode you have to complete as many levels as possible within the time limit. When the timer is red, this indicates the level must be completed within the time allocated. If you fail to complete the level within the time, you will loose a life and be given an additional 10 seconds with your next life. Scoring for each level is calculated by how much time you have remaining, along with your biggest chain and how many multipliers you have collected. Due to the graphical requirements some models of the iPhone / iPod Touch may not be able to run the game at the full smooth 60fps. You can change this to 30fps on the main menu.